For ventilation, light control and privacy, louvre windows are amongst the most practical of all window glazing treatments. They are well-suited for all enclosed spaces requiring controlled cross-breeze ventilation, and are particularly suitable in tropical and subtropical climates. A practical solution for control of light, sound and airflow. Naco Airflow louvre fittings are supplied as a kit to your specifications, ready to install in aluminium or timber frames. 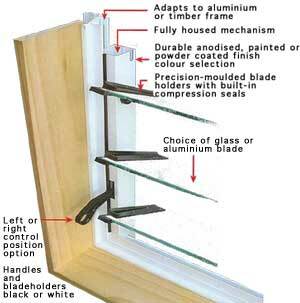 Glass or aluminium blades are available. 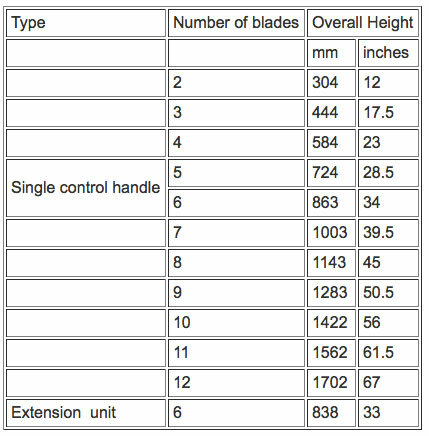 Calculate the number of blade required from the following table. Extended window heights (i.e. 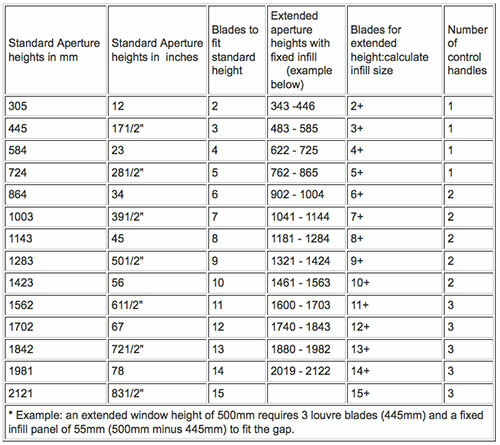 higher than standard sizes listed and within the next blade height) require fixed, custom-sized infill panels to fit remainder of opening depth. A fixed head weatherbar should be used above infill panels. For Naco louvres the recommended maximum single blade length is 760mm. 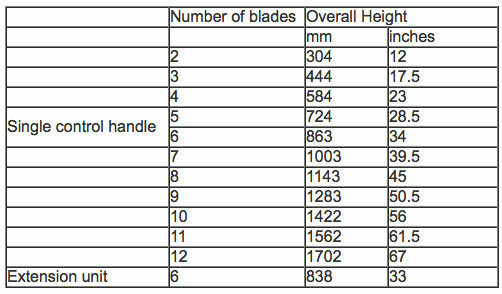 See diagrams to calculate louvre blade widths. A set of Cooper De Luxe Louvres consists of two aluminium mullions with attached operating mechanism and channels for holding the glass blades. These mullions are not joined together in any way and therefore can be spaced to fit any width opening with the maximum recommended of 762mm. 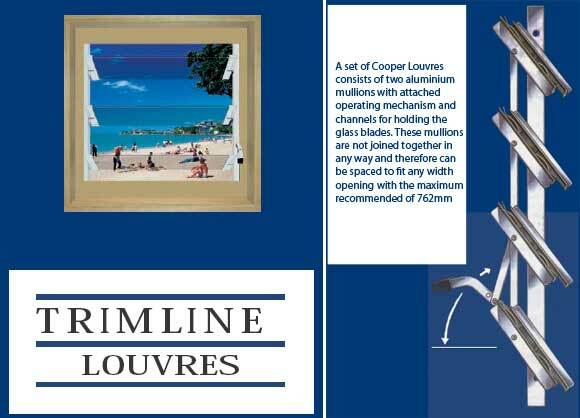 Before installing the louvre fittings, make sure the frame is square and true throughout. Failure to observe this fundamental instruction will cause the louvres to be stiff in operation and could result in air and water leakage. When screwing the louvre mullions to the side frame ensure that they are exactly parallel and opposite each other. Providing the frame is plumb in all directions this may be done easily by scribing a guide line down either jamb at equal distance from the outer face. Ease back the glass retaining clips and then insert the glass blade. When this is fully home the clip must be bent over the top edge to retain the blade in its correct position. The louvre must be in the locked position when fitting the sillboard at the bottom and the cover bead at the top. These should be brought up to but NOT pushing against the glass. This will ensure the weather-proof seal between the blades is maintained. This is most important as most complaints concerning faulty operation of the louvre are due to incorrect positioning of the sill-board or cover bead forcing against the glass preventing the blades sealing correctly. A set of Cooper Louvres consists of two aluminium mullions with attached operating mechanism and channels for holding the glass blades. These mullions are not joined together in any way and therefore can be spaced to fit any width opening with the maximum recommended of 762mm. Suitable for Hotels, Motels, Factories, Offices, Schools, Shops and Homes. The ultimate in controlled ventilation with a combined locking and operating handle. Pivots are specially treated to give smooth control. It is recommended that a spot of light oil be placed on each pivot periodically. The plastic tipped handle ensures comfortable and firm control. Left hand control is standard. Manufactured from anodised aluminium extrusions, lightweight and available in natural anodised finish, as standard. 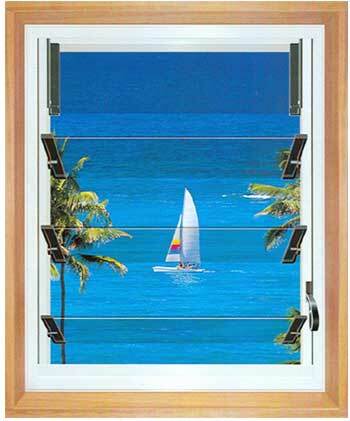 Fitted with a patented security stop which prevents glass being removed when the louvre is locked in position. 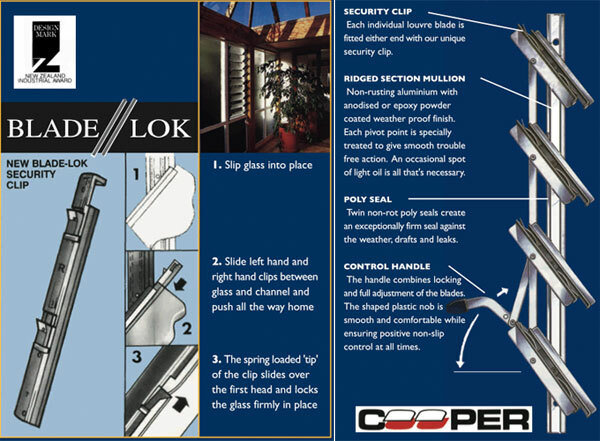 Glass blades are not supplied with the louvre fittings but are stocked by glass merchants in various types. With openings above 1702mm high it is necessary to stack sets of louvres on top of each other. To do this a specially modified 6 Blade louvre is available called a ‘6 Blade Extension Unit’. This can be used in conjunction with all the above sizes. .dxf files must be downloaded first and then opened in your ArchiCAD or AutoCAD program. Note that In some web browsers, the browser will attempt to display CAD drawings in the browser, which it is unable to do and you will receive a screen of odd looking code. If this happens, please return to this page and right click .dxf file and choose to save or download the file. The file will be saved as filename.dxf in your downloads folder unless you specify another location. Safari	right click on file > Download linked file as. If the file is saved as filename.dxf.txt rename to filename.dxf . You should be able to open the file as usual.